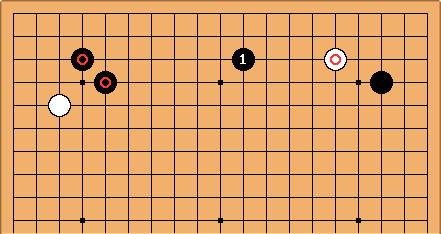 A pincer is a severe move, preventing an enemy approach stone to make a base. 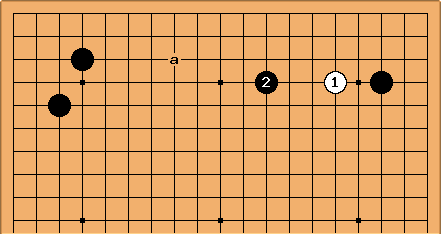 An extension maps out a sphere of influence making it more difficult for the opponent to approach. Combining a pincer with an extension obviously is interesting. Bill: is a bit far to be considered an extension, I think. It leaves room for a wariuchi at a, not to mention other invasions. Charles Matthews I think you can't have a 'nine-space extension', because a wedge in it doesn't constitute an invasion. But I have been told (and believed) that 'eight-space extension' makes sense, as the maximum. Dieter; Yes I was aware of the example not being optimal. Please replace with a better example and I'll try the same. Charles In this case looks efficient as a pincer on , and an extension from the formation. dnerra And here an example where the extension from the left is pretty solid. Probably White should consider playing at a instead. In that case, a pincer would make Black overconcentrated. Charles Isn't almost too close to Black's group anyway? What about at b? 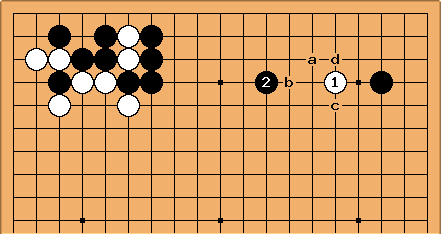 In fact Segoe played at c instead, against Go Seigen - this side formation is rare in pro play. 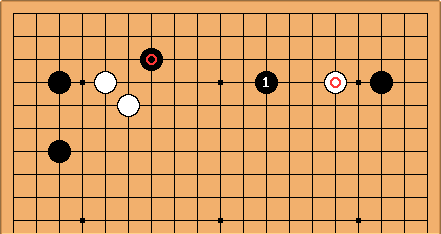 But White more often plays the approach at d.
This from 1995-11-09 is an example of the comparable thing, just with less thickness for Black: extends from while pincering . If you leave 6 spaces, the opponent has room for his own optimal extension inside yours. Charles Shusaku played here in one of his games. It's interesting to go back over some of these old ideas. In many cases they do relate to nineteenth-century go.